In another attempt to stop terrorist releases, MK Ayelet Shaked takes on a revolutionary task: changing the legal system itself. MK Ayelet Shaked (Jewish Home) and MK David Tzur (HaTnua) have taken on the ongoing terrorist releases by proposing a revolutionary bill: to change the fabric of the legal system itself. The bill, if passed, would change one of the Basic Laws of Israel, which forms the basis for the formation and role of Israel's institutions, and the relations between the state's different ministries and authorities. The Basic Law of the President of the State, passed in 1964, allows the President to pardon criminals - at least until now. The new amendment would change this rule, preventing any convicted terrorist from being pardoned for his crimes under certain conditions. The amendment seeks to allow the judges of the court during trials for nationalist murders, terrorist activity or any other heinous crime, to negate at the time of sentencing the possibility of providing future amnesty. The bill has already garnered tremendous cross-party support: it was signed by members of Jewish Home, HaTnua, Likud, Yisrael Beyteinu and Kadima. Shaked explained, "Releasing terrorists has never been a 'red line' of any government. Therefore it is important for us as legislators to stop the contemptible and despicable pardoning of terrorists and murderers. Right now, in the shadow of the terrorist releases, it is more important than ever to determine the 'red lines' of our governing system." "From now on, the courts will decide on a case-by-case basis whether or not a criminal can ever be pardoned," Shaked continued. "Extreme cases will be denied the right to pardon, so that murderers cannot generally become a tool for future negotiations." "If, legally, we can prevent future terrorist releases [. . .] we can put the country back on track." Tzur added, "the bill would ensure that despicable killers, who took the lives of innocent people and were sentenced to life imprisonment, will not be pardoned in a process that hurts the justice system." The explanatory section to the bill notes the fears many have had that the releases have set a precedent enabling more terrorism. "In recent years, the State of Israel released a large number of terrorists as part of prisoner release transactions or a policy of gestures. The reality has led to an absurd situation in which terrorists who committed murder as part of their struggles against Israel are released a long time before the end of their sentence. This fact constitutes a moral failure and contempt for the severity of terrorist acts and the authority of the judicial system." 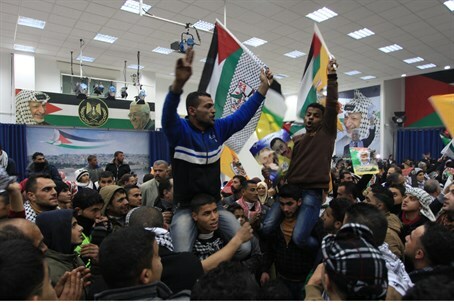 Earlier Tuesday, Prime Minister Binyamin Netanyahu warned that the Palestinian Authority's celebrations at the releases, and their incitement to violence, were a serious stumbling block to peace. “Murderers are not heroes. This is not how you educate people to peace. This is not how you make peace,” he warned. “Peace can exist only when the education to incitement and to destruction of Israel is stopped."